Effective program evaluation is an essential component of STEM education and workforce development. These no-cost evaluation-focused webinars will help you develop evaluation plans that meet the needs of INCLUDES (Inclusion across the Nation of Communities of Learners of Underrepresented Discoverers in Engineering and Science) Pilot and Alliance Projects. Webinars will be of interest to individuals involved in current or upcoming INCLUDES projects, those considering collaborating in such projects, and STEM educators considering inclusion of formal evaluation in their projects. Co-organized by the NIMBioS and the National Institute for STEM Evaluation and Research (NISER), these webinars are a continuation of the NIMBioS/NISER series of STEM program evaluation events for the NSF INCLUDES projects. The target audience members for this webinar are STEM educators who are carrying out STEM broadening participation projects, including leaders of NSF INCLUDES projects. These STEM evaluation activities are supported by the National Science Foundation through award HRD-1650390 to the University of Tennessee, Knoxville. Any opinions, findings, and conclusions or recommendations expressed in this material are those of the author(s) and do not necessarily reflect the views of the National Science Foundation. 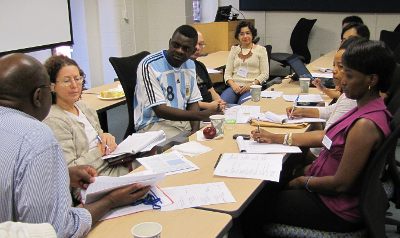 June 7: Evaluation Strategies for Measuring the Broader Impacts (BI) of NSF INCLUDES Projects. Planning for the measurement of Broader Impacts (BIs) can feel overwhelming to project leaders. Some of the ways evaluators can encourage effective definition and measurement of BIs is through program and stakeholder mapping of outcomes related to BI goals, and through appropriate measurement tools. In this webinar, participants examined different models for relating BIs to their project activities, and also tools for measuring progress towards BI goals. May 3: Qualitative Data in Culturally Rich Evaluations of NSF INCLUDES Projects. Evaluators often incorporate qualitative methods to understand the context through which participants from different backgrounds experience a program. Assembling knowledge from sources such as focus groups and interviews and layering them with methods such as observations, analytic memos, field notes, and reflective journaling, can help project leaders understand diverse perspectives. Participants in this webinar engaged with case study materials to code and analyze culturally rich data for program evaluation. We shared tools and methods for layering data in qualitative analyses with participants. April 5: Engaging Diverse Populations in Evaluations of NSF INCLUDES Projects. This webinar provided insight into the ways in which cultural competency can contribute to mindful evaluation of diverse populations. We addressed understanding of social and personal biases towards diverse populations and how we can we assure that we are not imposing our own beliefs into our research and evaluation. We also discussed ways to understand social norms of diverse cultures. Participants in this webinar explored approaches to identify potential barriers and opportunities for culturally responsive evaluation data collection. March 1: Program Models as a Tool for Scaling up NSF INCLUDES Projects. Evaluation of projects often begins with a program model as a plan for successfully measuring activities, outcomes and impacts. When projects scale up to include multiple sites and projects, these models must also scale up. This webinar engaged participants with case study examples of evaluation design techniques that can be applied to the scaling up of INCLUDES projects. Communication strategies, program mapping techniques, and data sharing and analysis plans gave participants a tool kit for adaptation to their own project evaluations. Feb 1: Evaluating Social Media Impact in NSF INCLUDES Projects. Social media is increasingly an integral part of these projects. Whether using Instagram, LinkedIn, Facebook, Twitter, Snapchat or another social media platform, project leaders must decide which platforms bring high impact to their project and how to allocate limited resources to the various possibilities. Participants in this webinar had the opportunity to learn about online measurement and analytic tools as well as social media evaluation design plans to increase communication and engagement with stakeholders within their project and to determine the most effective social media plans for their projects.